This walk: 2012-6-22. Hutholes medieval village, longhouse, cooking hole, leats, Rowden Ball, Rowden Tor, memorial plaques to Jeffrey and Mary Malim, Assycombe Hill, slotted gatepost, French's Lane, tadpoles, Heath Spotted Orhids, West Webburn River, Jordan, linhay or mowhay, Indian Bean Tree, step stile, sheep creeps, bull, Bittleford Farm, Two Crosses Stone. Link to Google Satellite view of the area - showing the Hutholes site at tjhe centre of the aerial view. Previous walks in the area: 22 April 2009 (incl. Hutholes) and 24 August 2011. Notice seen near the car park. National Park sign describing the Hutholes area. Click the image to see a large version of the notice. There were turf buildings on this site before the stone ones. One building was the manor farm, mentioned in the Domesday Book as held by a wealthy Englishman, Alric in 1066. He had been obliged to hand it over to one of the conquerors, William de la Falaise, by 1086.This would have been the original Dewdon or Jordan manor house before it was re-sited 1 km away, along the West Webburn River. Source: J. Butler (1991) Dartmoor Atlas of Antiquities, Devon Books, Vol.1 - The East, pages 141-142. House no. 5 (from memory). House no. 1: a Dartmoor longhouse, with its side structure (an outshot or pentice). Cooking hole in Medieval longhouse no. 1 ..... complete with now-broken cover on which presumably cooking pots were stood in the 1250-1350 AD period. Behind - two drying ovens, possibly to dry corn in a time of deteriorating (wetter) climate. A movie panning around the Hutholes site. A few yards further up the hill, another apparently old leat, at SX 69950 76032, there is nothing on the map for this feature. Jeffrey Wentworth Malim, 1877-1958, author of The Romance of Dartmoor, Publisher: S. Marshall, 1935. In Memory of Mary Malim, 1876-1953. "Covering the Widecombe District at the end of his very interesting talk, Tim Jenkinson showed the meeting photographs of Rowden Tor on Rowden Ball with the two �Malim� memorial plaques of Jeffrey and Mary Malim and the nearby stone hut circle. The Malins used to stay in the locality and he is believed to have been part responsible for the building of Duck�s Pool Letter Box." Another view of this minor tor. Closer view of the slot. Slotted gatepost on the right, in French's Lane, starting at SX 6980 7572, an old drovers' lane going towards East Shallowford and Jordan and part of the old church path to Widecombe. Looking up the lane from the bottom, where it joins the local road. The signpost at the turn-off. Beard-like lichen blowing in the wind. Jordan Manor - the path goes through what was once the farmyard and as such it is still enclosed by gates at each end. It is described briefly by John Hayward (1991, reprinted 2009), Dartmoor 365, Curlew Publications, page 233. Old linhay (for tools) or mowhay (for hay). Indian Bean Tree, Catalpa bignonoiodes beside the path at Jordan, no sign of flowers or fruit though. A step stile, set into the hedge. Either side of the path at SX 70268 74940, approaching Bittleford farm. Bittleford Farm, the signpost pointing the direction we came across the field from is seen at top left (by another stile). The Two Crosses Stone, instigated by the Widecombe History Group, placed where the manors of Dunstone, Jordan, Blackslade & Widecombe border each other. The stone is a donated gatepost and was inscribed by the Dartmoor National Park Authority's stonemason, Andy Cribbet. Originally, the Lord of the Manor of Dunstone had planned to erect either two crosses or a cross with four arms, but he died before it was done. For a long time afterwards, two crosses were cut in the turf each year. Detail of the fact that this was once a gatepost, an old iron gate hanger, near the top right corner in the previous photograph. The stone is across the road from the car park. 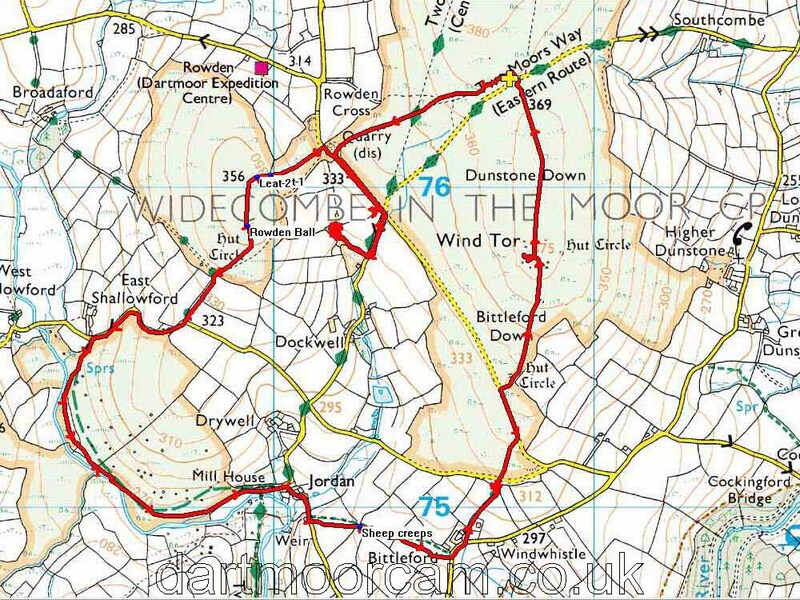 This walk was reached by driving south-west out of Widicombe, taking the first road on the right, going west, uphill past Southcombe, and parking on the right just over the brow of the hill at the yellow cross symbol on the map. Distance - 7.01 km / 4.36 miles.